Stainless steel flask with US Army Emblem laser engraved onto from with name and rank. Perfect for tailgating, picnics or to display on a shelf or table. Each engraved flask proudly displays the United States Army Emblem and the soldier's name and rank. Any army man or woman would be proud to receive this classic gift. 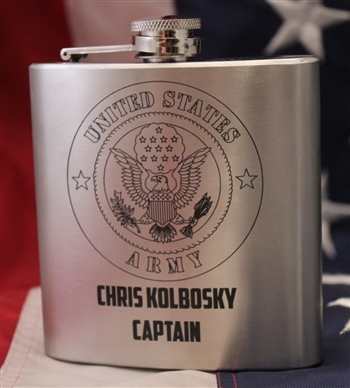 Your personalized Army flask will be delivered by the U.S Postal Service. Priority Mail will be used and a tracking number will be sent to you.